Now my little ones is hitting the 2 year old mark, she has become a little fussy (just like her brother) in the eating vegetables club (or perhaps that she be the not eating vegetables club). So I am becoming more experimental with adding vegetables (especially greens) into thinks she might be likely to eat, also if I can get my oldest to eat them too, then it has got to be a bonus. 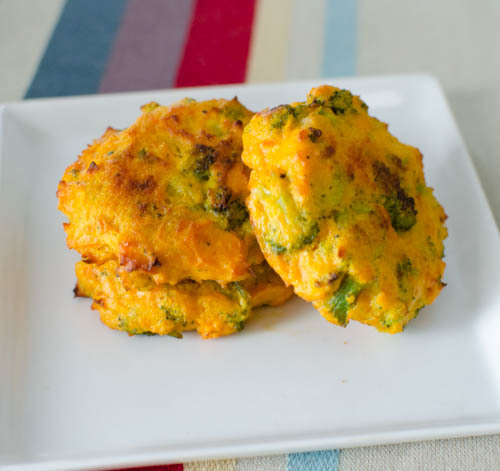 Both my kids love sweet potato and both of them love cheddar too, so what better way to hide some greens than in these yummy broccoli and cheddar patties, but not only that, these are yummy for adults too. Place sweet potato above some boiling hot water in a steam and steam until tender. Remove and set aside. Add the broccoli to the steam and steam for a couple of mins just to slightly soften. Add this into the sweet potato, along with the cheddar and black pepper and roughly mash to combine all together. Set aside and allow to cool. Add the beaten egg and mix. Form into equal sized patties, you can make these any size you choose, small for little hands or slightly bigger for adults. My daughter loves these!! I added tuna to half the batch to get some extra iron and extra protein into them, but she loved both versions!! So happy!! I just made these – thanks for the recipe! I was wondering though if you know if I could freeze them and reheat them (how? microwave?). These are amazing. I usually double the recipe and add a bag of frozen kale or spinach to them and my little guy devours them. I have made this multiple times and just freeze them. I reheat in the microwave. My twins LOVE these! I did a mix of frozen broccoli and cauliflower and added tuna and a bit more cheese to cover for that. They gobbled them up! Thank you! The whole family love this recipe! To make it even easier I cooked this week potato in the microwave, just nine minutes with 2 tablespoons of water. Jamie Oliver gave me that hint! I also used fresh broccoli.